A highly-toxic class-A drug is being sold in Scotland, according to senior police officers. ParaMethoxyMethylAmphetamine (PMMA) has been found in tablets which look like ecstasy. 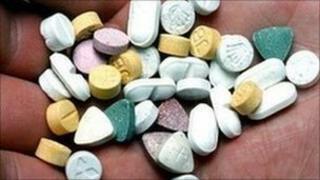 The substance has also been found in drugs being sold as "legal highs" in Scotland. The Association of Chief Police Officers Scotland said it had recovered quantities of PMMA after a series of raids. It has been produced in pink tablets with a Rolex crown logo, and in white tablets with a four-leaf clover logo. PMMA has also been recovered in powder form and police said it may also be present in other products and tablets. Det Insp Tommy Crombie, of the Scottish Crime and Drug Enforcement Agency, said: "PMMA is a stimulant similar to ecstasy but it is not as potent. "Users... may be tempted to take more tablets to achieve the desired effect, increasing the risk of a potentially fatal overdose. "I would strongly advise drug users to avoid such products and follow harm reduction advice where necessary."